Now, I am not a major science reader, I leave that to the spousal unit. I read some of The Immortal Life of Henrietta Lacks but I mainly got my information from her Fresh Air interview and talking to others who read the book. It's a fascinating story and very well written, it's a case of "It's not you, it's me." I'm not a big reader of really long non-fiction books. But enough about me (hee hee, too late) let's talk about the book. Breakthrough is about three doctors. Nope, wait, two doctors and a research assistant. 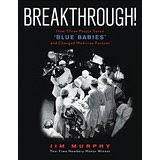 It tells the story of Dr. Alfred Blalock, Dr. Helen Taussig and Vivien Thomas, Dr. Blalock's lab assistant and their radical new surgery to save the lives of 'blue babies'. These were babies born with a congenital heart defect, tetralogy of Fallot, that caused insufficient oxygen in the blood. Since deoxygenated blood is blue and this color is seen where vessels are close to the surface (fingertips, etc.) babies with this defect were called "blue babies"
The survival rate of children born with this defect was very low, "Twenty-five percent of children born with tetralogy of Fallot died before their first birthday; 70 percent were dead by the age of ten." Dr. Blalock was an internationally famous physician, due to his groundbreaking work on the causes and treatment of shock (which took many lives on the battlefield) while at Vanderbilt and then Johns Hopkins University. Vivien Thomas, an African American man, had wanted to go to medical school and had worked very hard to achieve that goal. He was accepted to Tennessee State College in 1929, but lost all his tuition money when the Depression hit and his bank closed its doors. Dr. Helen Taussig was dyslexic (before that had a diagnosis or name) and a woman who wanted to become a doctor at a time when "only 5% of practicing doctors in the United States were women." Women were often denied admittance or even their degrees (after they had completed their studies). Dr. Taussig did become a doctor and was actually asked to run the pediatric cardiac clinic at Johns Hopkins when it was created in 1930. In 1938, Dr. Taussig read about an operation that gave her an idea about an operation that could help her 'blue babies' that she was unable to save. She discussed it with a Dr. Gross at Harvard who dismissed her idea out of hand. Why is this a political point? Well, watching the election coverage, I would say that women (one in particular) are still subjected to such an extreme double standard when it comes to behavior. A male doctor's concern would not have been seen through such a condescending lens. She saw her chance to try again when Dr. Blalock came to Johns Hopkins. She met with Blalock and Thomas and they were receptive to her ideas (and surprised she had a "pleasant personality" sigh). Thomas immediately started studying the collection of defective hearts that Taussig had (she was literally surrounded by her failures, making her more determined to find a cure) and coming up with ideas for an operation. It is also fascinating (and aggravating) to note that although Thomas perfected the surgery, he was never allowed to operate on human patients (he practiced on dogs, and the book does talk about protests against animal experimentation), he would have to stand behind Blalock and advise him. Warning: There is a photo in this book of two lynched African Americans dangling from a bridge. It is horrifying and jarring and shows the heartlessness of the lynch mob. They took souvenir photos which they often made into postcards.